The Mindfield eSense is a small sensor which actively measures the temperature of the skin relying on the body reaction to stress (e.g. the muscles contract, therefore narrowing the blood vessels, so the skin temperature gets lower). 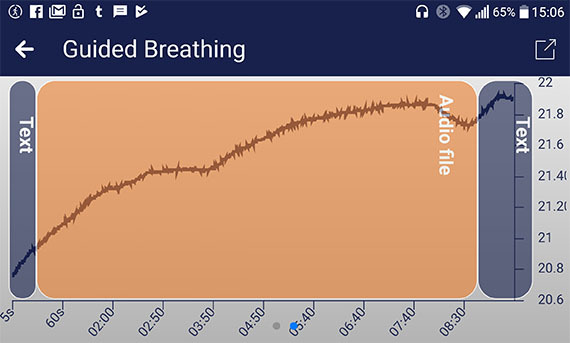 This way, when connected to a mobile device (via the headphone jack), the eSense application displays a live representation of the skin’s temperature and the user should immediately notice any change, therefore easily identifying any stress sources. Besides the eSense temperature sensor, the manufacturer also features a eSense Skin Response device which functions in a similar manner, but instead of measuring the temperature, it applies a low voltage to the fingers (it’s unnoticeable) through two electrodes in order to measure the skin conductivity (in µS (µSiemens)). 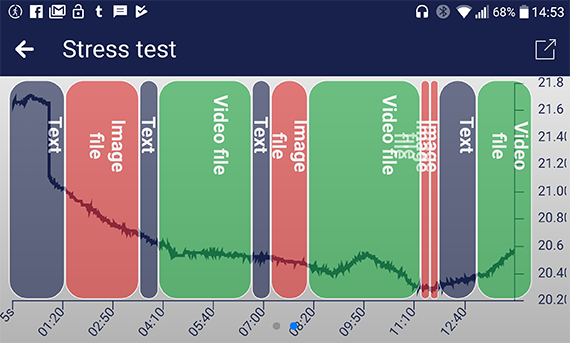 The app also includes several types of feedback (including visual, tactile or audio, using the mobile device’s functions, as well as via a smart bulb) and it allows the creation of modules for personalized stress tests, relaxation guides or to simply use it in the context of psychological research. 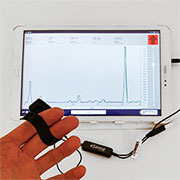 The detection of emotional changes using the skin temperature is not really new and historically speaking, this contact-type method has been used in various well-known applications, such as the polygraph test (lie detector), where the device would quickly detect any emotional arousal or mood change. This indicates that these types of instruments have long been used as reliable tools for the development of psychological methods and even today you’ll often find these type of sensors used for patients that have suffered some form of brain damage (such as aphasia, where the psychologist can easily see when the patient experiences elevated stress levels) or along with the Rorschach and Jung’s association tests. The eSense Temperature device can be used for all these applications, but its raison d’etre seems to be mainly for relaxation purposes, helping you with meditation and overall, for improving your well-being. The device itself comes into a small package and consists of a main rectangular body made of plastic, with two wires exiting one side (one wire is longer and connects to the 3.5mm headphone jack of your mobile device, while the other wire has a connector for headphones – useful if you want to get audio feedback) and a single thinner wire exiting the other side, which ends with a temperature sensor. The sensor seems to resemble a bead thermistor and from the looks of it, Mindfield recycled the case: the GSR eSense features a pair of sensors which get in contact with the skin using two velcro strips. The main body of the eSense device that I got hasn’t really been readjusted, so I could see that the two plastic parts don’t perfectly clip together (although, this hasn’t affected the product’s functionality or robustness in any way). 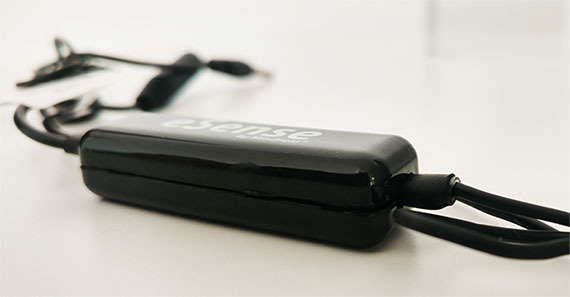 The eSense Temperature bundle offers more options, so it also includes a separate finger clip suitable for sensing the temperature (it has a special canal where you can insert the single sensor), an adhesive tape, a separate adapter cable which inverts the connector pins of the microphone jack on some older Android mobile devices that may not support the eSense device; there’s also a Magic Blue dimmable smart LED light bulb (it is an IoT device and it requires a Bluetooth connection). 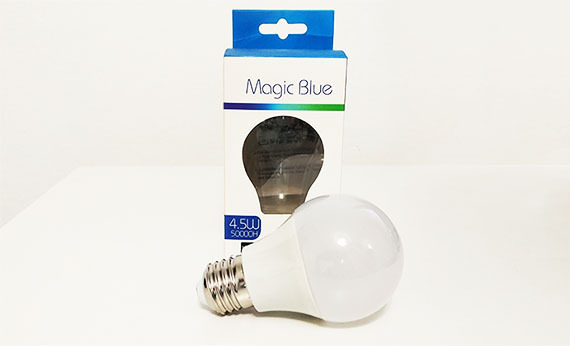 The Magic Blue smart bulb offers a high degree of customization: you can choose the colour, dim the light or select the speed at which the colour changes; it can also create patterns for specific songs that you can play from your mobile device or use the microphone to sing or speak something and the bulb will react to the sound. Additionally, using the camera, the LED light will match the colour seen by the camera or you can use the gallery photos and select a specific colour. When searching for the eSense Temperature app, you’ll notice two available applications, one is the eSense Skin Response app, which offers some basic functions (it can only detect fluctuations in the skin conductivity and nothing more), while the other is the Mindfield eSense app that offers the full experience and it’s the one that we’re interested in (both applications are compatible with Android OS (v4.4+) and with iOS products (newer than iPhone 4S, iPad 2nd Gen, iPad Pro and iPod touch from the 5th generation)). 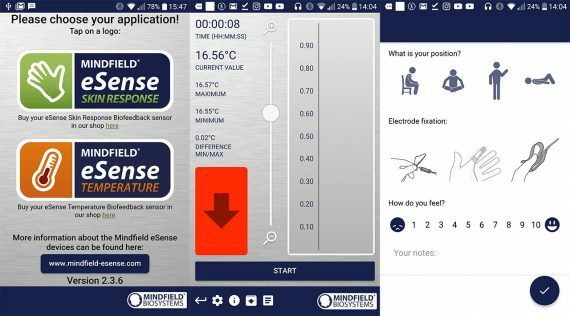 After you have installed and launched the Mindfield eSense app, you will be able to choose between eSense Skin Response and eSense Temperature. Obviously, I chose the latter and, the main page shows a graph, on the left with the elapsed Time, the Current temperature Value in degrees (Celsius or Fahrenheit), the Maximum, Minimum and Difference Min/Max, while immediately underneath, there’s an arrow which becomes green when the values are rising and red when the values get lower; on the right, you will see a live representation of the increasing or decreasing degree values and in the middle, you can adjust the graph. Choosing the former (eSense Skin Response) changes the degrees to µS and re-adapts the application to the measurement of the skin conductivity (the µS should be lower when we’re relaxed and higher when under stress). To quickly test the product, I connected the eSense device to a mobile device, started the app, I inserted the sensor inside the finger clip and then attached it to my fingers. On the app, I tapped Start and the values immediately started to rise. As a point of reference, I decided to see the default value when the sensor doesn’t touch the skin and every time after I removed the clip, the value would return to the standard value. When you want to finish the session, simply tap on Stop and you’ll be immediately sent to a page where you’ll be asked your position, the electrode type and about your general mood; immediately after, the app will show detailed diagrams with some interpretation of the recorded values: the Time Decrease, Steady and Increase, as well as the Difference between Min/Max and the Average temperature. To make things more interesting, you can tap on the small gear wheel icon on the bottom left which will summon the Settings. 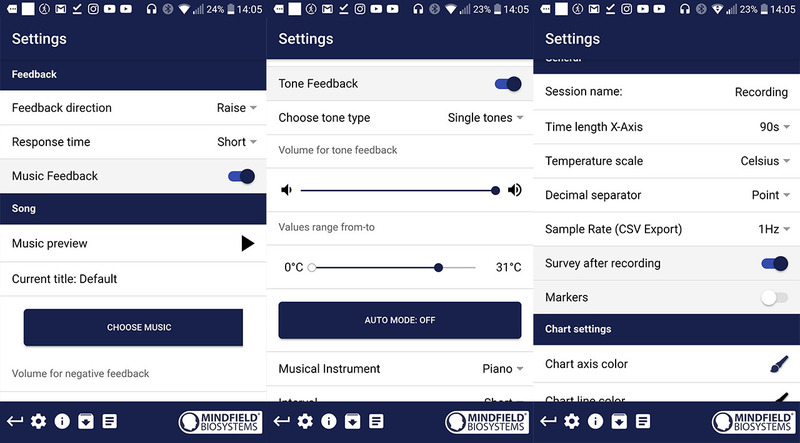 Here, you can set the Feedback direction (can be Lower or Raise), the Response time, you can enable the Music Feedback, the Tone Feedback, the Tactile Feedback and the Smart Bulb Feedback. The Music Feedback section is important because, by Default, you get to choose between some pre-existing relaxing songs or Instructions (for now, only Breath is available, but it does offer a full relaxation session by helping you focus towards your breathing). Whether you choose the breathing Instructions or a specific song, it will play continuously throughout the entire testing process. 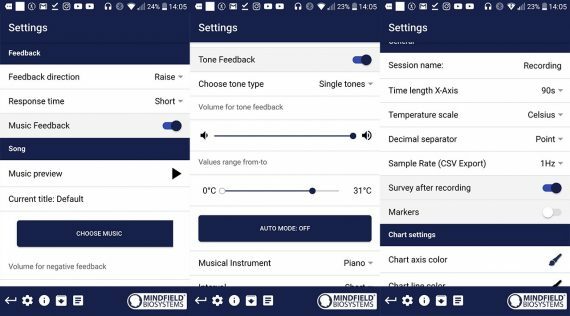 The Tone feedback is a bit different because it can either be a continuous hum or a single tone sound – you can set its volume and either let it on Auto Mode or manually select the value range of the degrees. The Tactile Feedback relies on the vibration function of your phone and it will behave differently depending on the rising or decreasing values. The Smart bulb feedback is perhaps the most fun feature since it pairs itself to the eSense app and it will light a specific colour depending on the detected value (the colours can be set on the UI). Besides these options, the Settings area allows the user to set a specific video to play during the testing process, but there are also some General and Chart settings to better fine tune the way the test will run, as well as the design of the interface. Besides the Settings section, you can also access the Manuals area (FAQ and Manuals available in different languages) or the Help area, where the manufacturer has added extensive informations about the eSense functionality and data interpretation, as well as a training guide (which walks you through four testing stages). 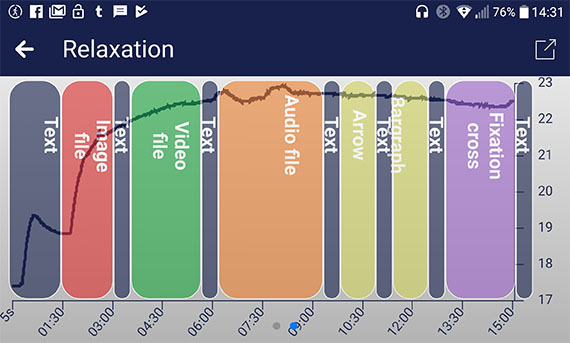 The next section of interest is the Archive which is divided into three areas: first, there’s the Recordings, where you can find every recorded session (tap on either to view detailed informations); next, there’s the Analyse area, which, as the name suggests, it shows Time statistics, the Average Session temperature, the Minimum and Maximum temperature, as well as the difference between the two values, the Time Decrease and Increase. The third Archive area is the Database, which allows you to either Import a new Database or export the existing data. One of the more interesting sections is the Procedures, where you have three demo sessions, one is Relaxation (requires 15 minutes and it guides you through an image, a video and audio file, followed by an arrow feedback, an adjustable bar graph and a fixation cross which changes its colour based on the detected values), the other is the Stress Test (requires 14 minutes and guides you through several stress-inducing factors (such as standing on one leg, cognitive stressors like enumerating a series of numbers backwards and some stressing images), each followed by relaxing videos – this test measures both the reaction to stressing factors and the stress recovery) and lastly, there’s the Guided Breathing (requires 9 minutes and a half and consists of several spoken instructions into controlling your breathing and relaxing your entire body – it is very useful for people suffering from anxiety or panic attacks). These default procedures have the role of teaching you how the modules work and how you can create your own custom procedures using videos, images, audio files, texts, arrows or bar graphs (those available or some custom ones). This way you can either create the perfect relaxation session which you can run at any time you feel stressed or it can be a valuable tool for psychologists (or other professionals). In its most basic form, the eSense device offers a live measurement of your skin’s temperature and it does its job wonderfully, reacting to any small change in mood, but the device is so much more because of the extensive customization available, as well as the ability to create personalized programs for yourself or your patients (the various types of feedback are a nice touch and the smart bulb pairing manages to add the fun element to this device). The main targeted audience seems to be the people that have stressful jobs or those with a busy lifestyle that desperately need to relax and the application can satisfy their needs, but at the same time, I’m sure a psychologist could make a fantastic use of the eSense Temperature along with the necessary types of therapy (e.g. : while treating speech-language pathology or aphasia).